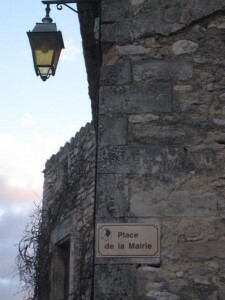 Well, now at least you know where the “Place de la mairie” is. Maybe it just got named. Good point Lise. Apparently there has been an ongoing debate about naming streets for the past two years. Maybe this is the first step in that process and everyone is excited that there is movement??? At least you won’t get lost even if JM is not home! In small towns, no point in naming street, because everybody knows where everybody lives. There’s the Main Street, and a side street. So why bother with names? Of course for strangers coming to town, it is a bit more complicated to get around. I remember many many years back how surprised I was when I first saw a map of Embrun, I thought: whatever for?